For our anniversary we decided that we would go out to lunch and stay in for dinner and cook something special. "Something special" to us means some kind of seafood. This night it was scallops. I must admit that I have never been much of a scallop eater. They are usually blah and chewy so I was a bit nervous about preparing them for our anniversary dinner. With the saute pan in hand, It was going to be the night to master the scallop! I had seen Ina Garten as she raved about her scallop dish, and I must admit that they always looked delicious so I pulled out her cookbook, Barefoot in Paris. 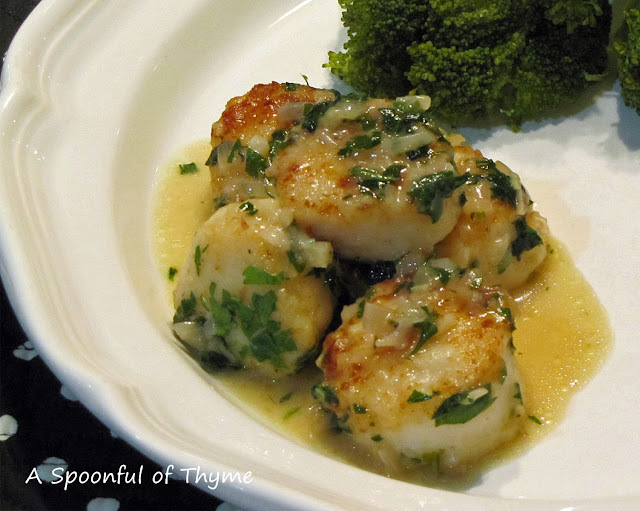 The recipe for Scallops Provençal looked perfect and appeared easy enough. We were only minutes away from a great anniversary dinner. Truly, minutes...scallops cook quickly! If you're using bay scallops, keep them whole. If you're using sea scallops, cut each one in half horizontally. Sprinkle with salt and pepper, toss with flour, and shake off the excess. In a very large sauté pan, heat 2 tablespoons of butter over high heat until sizzling and add a single layer of scallops. (Do not crowd the scallops in the pan.) Lower the heat to medium and allow scallops to brown lightly on one side without moving them, then turn and brown lightly on the other side. This should take 3 to 4 minutes total. Melt remaining butter in the pan with scallops; add shallots, garlic, and parsley and sauté for 2 more minutes, tossing the seasonings with the scallops. Add the wine and cook for 1 minutes longer. Add salt and pepper to taste. 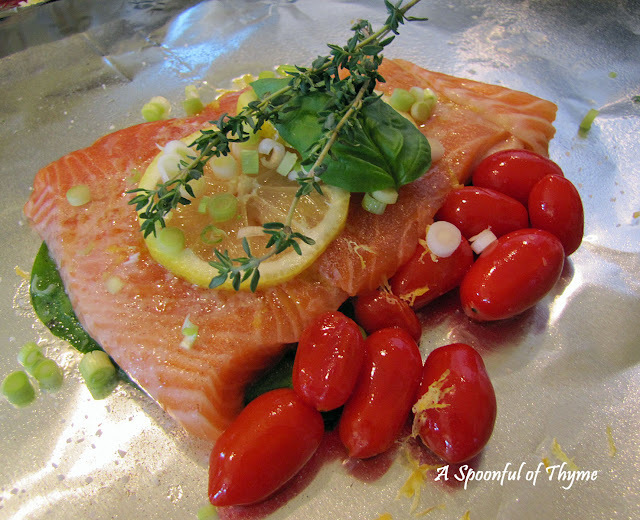 Serve immediately with a squeeze of lemon juice. This was the perfect anniversary dinner. I do believe that I am now a fan of the scallop! Scallops Provençal is even my new favorite recipe....what a great flavor...and cooked to perfection. If you are looking for a cookbook to add to your library, Barefoot in Paris would be a great addition. As a fan of scallops this is a must try, looks fantastic. Ah, so you've discovered my filet mignon of the sea! 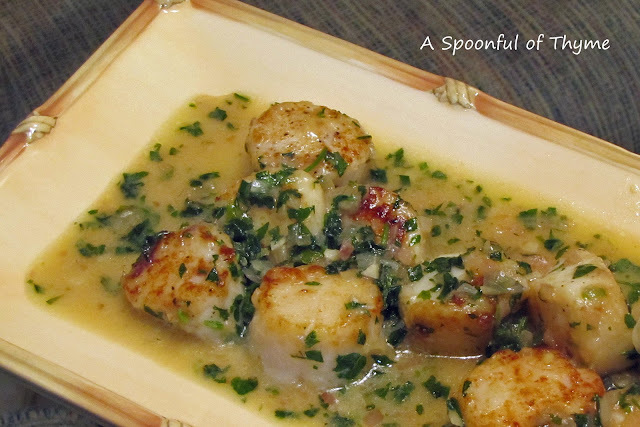 I love scallops and have made some of Ina's recipes. This one looks fantastic. Don't you love how easy they are to make? Oh this looks fantastic! really delicious - I can almost taste it! Love scallops an this is a super recipe - thanks! Those have to be the most delicious scallops I've ever seen! My Mom is crazy for them and she would love this! Happy Anniversary! Happy Anniversary, Kate! And your celebration scallop dinner looks excellent. You can't go wrong with Ina! Your anniversary dinner looks delicious, Kate. I just bought Ina's Paris cookbook and am happy to know that your liked her recipe. Happy Anniversary! Oh my, I have to try this. Barefoot in Paris is the only one of Ina's books that I don't have, which is silly since I love Paris so much. Thanks for the recipe and happy anniversary. These look beautiful. I have not heard about this cookbook. It will be on my list. I almost bought Qualicum Bay Scallops for dinner last night but ended up with four small live lobsters instead. This looks amazing !! Must try ! !